On this page we will give an overview on what facilities for recycling you can expect to find in your local area. All the facilities provided locally by either your Municipal Council Private Waste Recycling Companies, or by Local Community Initiatives, are designed to help you the householder recycle and do your bit to meet local and national targets, but don't forget to be individually creative in reducing, reusing, and recycling as well. See other pages on this site for ideas and tips. Most, if not all, Municipal Councils across the UK, will have weekly doorstep collections of household recycleable waste. This will include a black bin (probably a wheelie bin) for ordinary, unrecycleable rubbish, a green bin for garden waste, including grass clippings and compostable food items, and a black box for both newspaper and glass. Some areas now include a blue box which is for the collection of plastics. This system of doorstep collection should become standard across the country if it isn't already. A specially adapted truck does the rounds at set times, with refuse collectors sorting the items out into separate compartments in the truck as they move around each neighbourhood. This system establishes a contract between council and householder- as we have seen in the news recently, some councils have successfully prosecuted people who put things in the wrong bin, or fail to make an effort to recycle at all. In addition to the above service, you will have seen at your local shopping area, supermarket, or community area, several large bins or skips for recyclable items, usually paper, glass, and possibly aluminum and tin cans as well. Other types of facilities include bins for books and clothes, operated by the big charities, that can sell them through their chain of charity shops, and around Christmas time, containers for Christmas cards appear as well. Supermarkets are under increasing pressure from Government and consumer groups to deal with the vast amount of packaging that comes wrapped around the products they sell, so including recycling facilities at or around their stores is partly a response to this, as well as being a service to the local community that they serve. Recycling Centres are generally based at or nearby landfill sites. 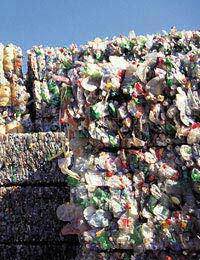 They exist both to receive recycleable waste, and recycle it at source or pass it on, and also to filter the waste that comes from household and business collection. Often they act as secondhand stores, with vast collections of old televisions, lawnmowers, books, sinks, computers and a plethora of other bric-a-brac that householders have failed to reuse, pass on, or donate. It is worth visiting your local centre from time to time, both to pick up a bargain, and also to marvel at the sheer amount of stuff that we all chuck out, that can easily be fixed, and is of use to someone, somewhere. Here you can also get a sense of the amount of newspapers, for instance, or wine and beer bottles, a local community gets through in a period of time. Many centres now have composting facilities, where you can buy bags of garden-ready compost, made directly from the hedge clippings and potato skins you brought there several months ago.